In 2002, Shannon Leone Fowler was swimming in the Gulf of Thailand with her fiancé, Sean, when Sean was stung by a highly venomous box jellyfish. Sean died almost instantly on the beach. Shannon has written a stirring memoir about the incident. In Traveling with Ghosts, she tells her story not only of that moment on the beach on the island of Ko Pha Ngan, Thailand, but also of the bureaucracy she faced in the aftermath, the kindness of two young travelers who stepped in to help her, and how her subsequent travels in some other grief-stricken parts of the world gave her new perspectives on loss, kindness, resilience, and emotional recovery. 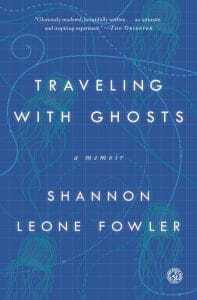 Order Shannon’s book, Traveling with Ghosts. On this month’s episode of the Globejotting Travel Show, Shannon talks with me via Skype from her home in London.